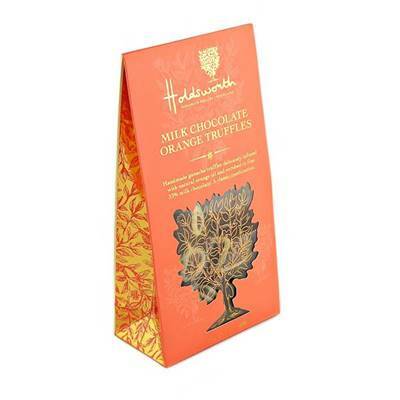 These handmade orange infused truffles and enrobed in the finest milk chocolate. Perfect for the whole family to share. This stunning ‘Treat bag’ is also available in Sea salt Caramel, Marc de Champagne & Jamaican Rum – Click to view. Ingredients: Milk Chocolate 58 % (Sugar, Cocoa Butter, Whole Milk Powder, Cocoa Mass, Emulsifier: Soya Lecithin, Natural Vanilla), Dark Chocolate (Cocoa Mass, Sugar, Cocoa Butter, Emulsifier: Soya Lecithin, Natural Vanilla), Butter (Milk), Fondant (Sugar, Glucose (Wheat), Water, Preservative: Sulphur Dioxide), Orange Purée 2 % (Glucose Syrup (Wheat), Invert Sugar Syrup, Orange, Natural Flavouring, Ethanol, Acidifier: Citric Acid, Colouring Plant Concentrates (Carrot, Pumpkin)), Alcohol (Neutral Spirit, Orange Liqueur 1 %), White Chocolate (Sugar, Cocoa Butter, Whole Milk Powder, Emulsifier: Soya Lecithin, Natural Vanilla), Orange Oil 0.2%.